A few weeks ago, I was pumped about painting this year's pumpkins. So when I finally got around to it this weekend, I had a million different ideas and designs in my head. I got my pumpkins, stocked up on some new paints...I was ready to go! By the way, Martha Stewart paints are 30% off at Michael's right now. I mapped out my plan. Thinking back...I should have just gone with one theme/design for all 3 pumpkins but I couldn't contain myself. Started out with a white base on one. A rose gold base on another. And a initial coat of multi-color dots. I wish I would have stopped there...but again, I couldn't contain myself. I had every intention of hand painting my own "A" (for my last name) on the white pumpkin. I started painting it, it was terrible...so I decided to use a black sharpie instead. I still didn't like it, so I went with an "A" stencil. 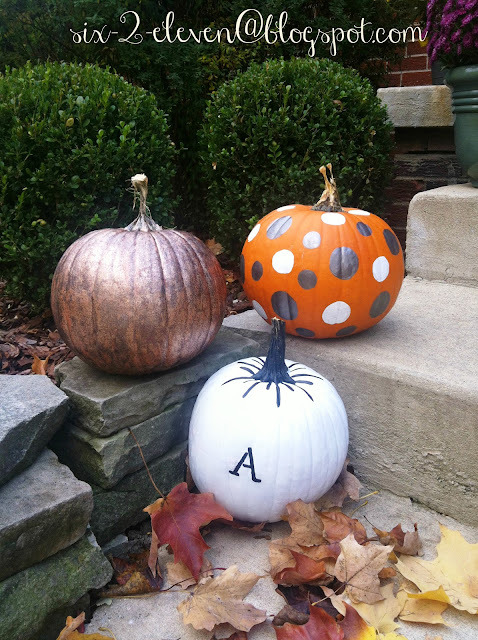 What I didn't realize is that that you can't paint over sharpie on a pumpkin. Coat after coat after coat, it still came through. For all you pinners out there, I've pinned this on my Pinterest page here. These look so awesome! And I actually like the A monogram - it looks good! Super cute pumpkins! Love the glitter one!